In filtration technology, the “steps” between the input and the output of a filter are called “elements,” “layers,” or “media.” I will here speak of “elements” of the Great Filter, and I will here take seriously the idea that, “…one or more of these [elements] are very improbable.” In other words, the Great Filter may be one or many, and we do not yet know which one of these alternatives is the case. 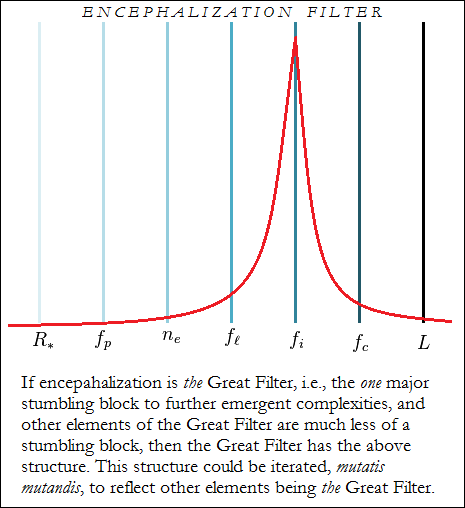 Most formulations of the Great Filter reduce it to a single factor, but I want to here explicitly consider the Great Filter as many. 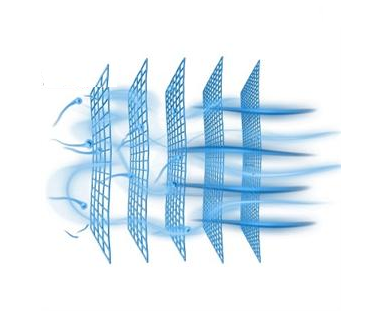 What is the Great Filter filtering? Presumably, the higher forms of complexity that are represented by the successive terms of the Drake equation, and which Big History recognizes (according to a slightly different schema) as levels of emergent complexity. The highest forms of complexity of which we are aware seem to be very rare in the universe, whereas the relatively low level of complexity — like hydrogen atoms — seems to be very common in the universe. 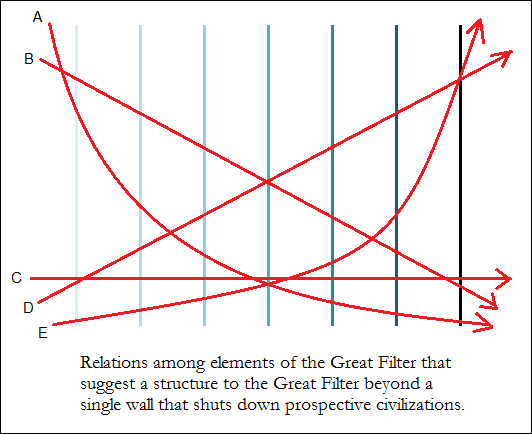 Somewhere between plentiful hydrogen atoms and scarce civilizations the Great Filter interposes. 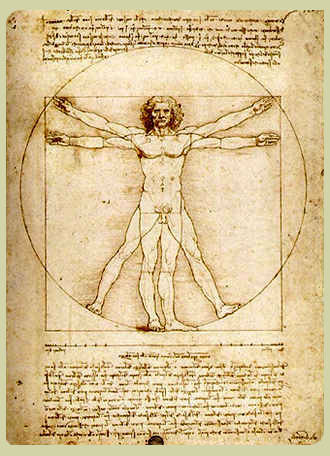 And there may yet be forms of complexity not yet emergent, and therefore a filter through which we have not yet passed. Hanson mentions visible colonization of the visible universe — this is a different and a much stronger standard to overcome than that of mere intelligence or civilization. 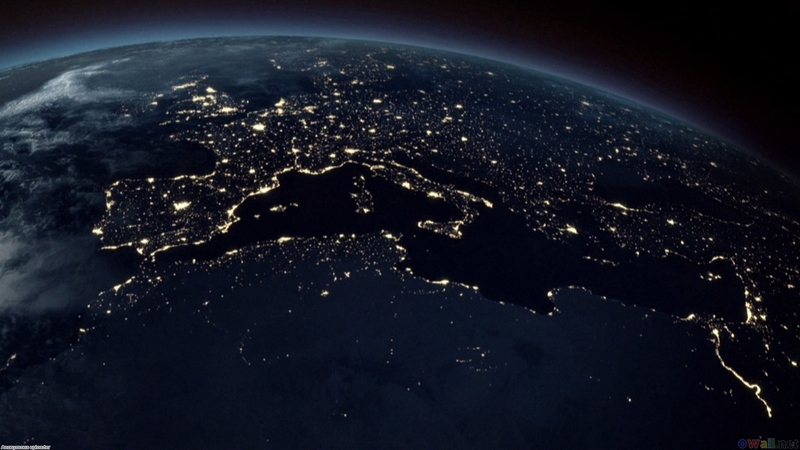 Our own civilization does not constitute visible colonization of the universe, in so far as visible colonization means the consequences of intelligent colonization of the universe are obvious in the visible spectrum, but there is a sense in which we are highly visible in the EM spectrum. Thus the scope of the “visibility” of a civilization can be construed narrowly or broadly. Construed broadly, the “visible” colonization of the universe would mean that the effects of colonization of the universe would be somewhere obvious along some portion of the EM spectrum. We can imagine several such scenarios. It might have been that, as soon as human beings put up the first radio telescope, we would have immediately detected a universe crowded with intelligent radio signals. We might have rapidly come to a science of analyzing the classifying the variety of signals and signatures of exocivilizations in the way that we now routinely classify kinds of stars and galaxies and now, increasingly, exoplanets. Or it might have been that, as soon as we thought to look for the infrared signatures of Dyson civilizations, we would have found many of these signatures. Neither of these things did, in fact, happen, but we can entertain them as counterfactuals and we easily visualize how either could have been the case. The difference between a universe that is visibly colonized and one that is not is like the difference between coming over the ridge of hill and seeing a vast forest spread out below — i.e., a natural landscape that came about without the intervention of intelligence — and coming over the ridge of a hill and seeing an equally vast landscape of a city spread out below, with roads and building and lights and so on — i.e., an obvious built environment that did not come about naturally — out of reach from a distance, but no less obvious for being out of reach. 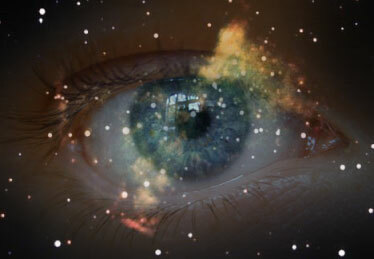 At present, when we look out into the cosmos we see the cosmological equivalent of the forest primeval — call it the cosmos primeval, if you will (with a nod to Longfellow’s Evangeline). In the illustration below the Great Filter is everything that stands between an empty universe and a universe filled with visible colonization by intelligent agents and their civilization. 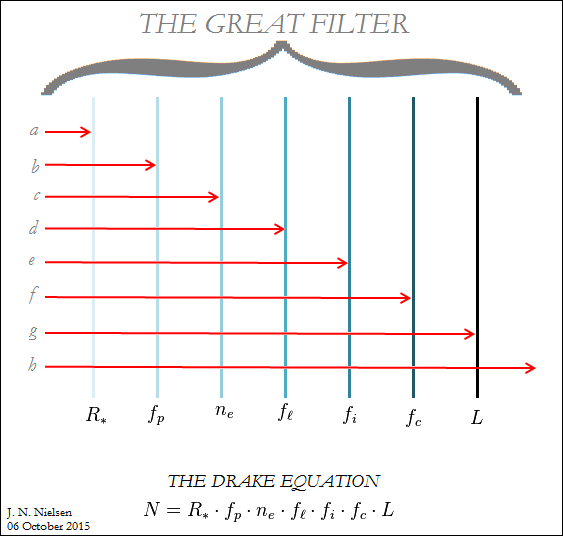 The Great Filter is then broken down into seven (7) diminutive filters, each a filter “element” of the Great Filter, which correspond to the terms of the Drake Equation. We could choose other elements for the Great Filter than the terms of the Drake equation, but this is a familiar and accessible formalism so I will employ it without insisting that it is exhaustive or even the best breakdown of the elements of the Great Filter. The reader is free to substitute any other appropriate formalism as an expression of the Great Filter, with any number of elements. Given a Great Filter constructed from a series of lesser filters, relations between the elements of the Great Filter (the individual lesser filters) describe possible permutations in the overall structure of the Great Filter, as I have attempted to illustrate in the image below. E – A logarithmic Great Filter in which successive elements of the filter are each progressively more difficult to pass through by an order of magnitude for each element (my drawings are, or course, inexact, so I appeal to the leniency of the reader to get my general drift). In the case of a Great Filter of an inverse logarithmic scale, the first filter element is by far the most difficult to pass through, and every subsequent element is an order of magnitude easier to pass. Once given the universe, then, intelligence and civilization are nearly inevitable. While such a filter seems counter-intuitive (most filters begin with coarse filtration elements and proceed in steps to finer filtration elements), something like may be unconsciously in mind in the accounts of the universe as a place teaming not only with life, but with civilizations — what I have elsewhere called an intelligence-rich galactic habitable zone (IRGHZ) — and I note that such visions of an IRGHZ often invoke the idea of inevitability in relation to life and intelligence. However, this is not the problem that the universe presents to us. We do not find ourselves in the position of having to explain the prolixity of civilization in the universe; rather, we find ourselves in the predicament of having to explain the silentium universi. The above analysis ought to make it clear that, not only do we not know what the Great Filter is — i.e., we do not know if there is one factor, one element among others, that is the stumbling block to the broadly-based emergence of higher complexity — but also that we do not know the overall structure of the Great Filter. Even if I am right that encephalization could be singled out at the Great Filter (as I postulated in Is encephalization the Great Filter? ), and the one especially difficult element of the Great Filter to pass beyond, there are still further filters that could prevent our civilization from developing into the kind of civilization that Hanson describes as visibly colonizing the universe, that is to say, a cosmologically visible civilization. We can easily project a universe with a spacefaring civilization so pervasive that the stars in their courses are diverted from any trajectory that would be based on natural forces, that the constellations would have an obviously artificial character, and that use of energy on a cosmological scale leaves unambiguous infrared traces due to waste heat. A universe that was home to such a civilization would have passed beyond a filtration element that we have not yet passed beyond. Recently Paul Gilster has posted my Who will read the Encyclopedia Galactica? on his Centauri Dreams blog. In this post I employ the framework of Fred Adams and Greg Laughlin from their book The Five Ages of the Universe: Inside the Physics of Eternity, who distinguish the Primordial Era, before stars have formed, the Stelliferous Era, which is populated by stars, the Degenerate Era, when only the degenerate remains of stars are to be found, the Black Hole Era, when only black holes remain, and finally the Dark Era, when even black holes have evaporated. These major divisions of cosmological history allow us to partition the vast stretches of cosmological time, but it also invites us to subdivide each era into smaller increments (such is the historian’s passion for periodization). The Stelliferous Era is the most important to us, because we find ourselves living in the Stelliferous Era, and moreover everything that we understand in terms of life and civilization is contingent upon a biosphere on the surface of a planet warmed by a star. When stellar formation has ceased and the last star in the universe burns out, planets will go dark (unless artificially lighted by advanced civilizations) and any remaining biospheres will cease to function. Life and civilization as we know it will be over. I have called this the End-Stelliferous Mass Extinction Event. It will be a long time before the end of the Stelliferous Era — in human terms, unimaginably long. Even in scientific terms, the time scale of cosmology is long. It would make sense for us, then, to break up the Stelliferous Era into smaller periodizations that can be dealt with each in turn. Adams and Laughlin constructed a logarithmic time scale based on powers of ten, calling each of these powers of ten a “cosmological decade.” The Stelliferous Era comprises cosmological decades 7 to 15, so we can further break down the Stelliferous Era into three divisions of three cosmological decades each, so cosmological decades 7-9 will be the Early Stelliferous, cosmological decades 10-12 will be the Middle Stelliferous, and cosmological decades 13-15 will be the late Stelliferous. Another Big History periodization that has been employed other than that of Adams of Laughlin is Eric Chaisson’s tripartite distinction between the Energy Era, the Matter Era, and the Life Era. The Primordial Era and the Energy Era coincide until the transition point (or, if you like, the phase transition) when the energies released by the big bang coalesce into matter. This phase transition is the transition from the Energy Era to the Matter Era in Chaisson; for Adams and Laughlin this transition is wholly contained within the Primordial Era and may be considered one of the major events of the Primorial Era. This phase transition occurs at about the fifth cosmological decade, so that there is one cosmological decade of matter prior to that matter forming stars. At the beginning of the Early Stelliferous the first stars coalesce from matter, which has now cooled to the point that this becomes possible for the first time in cosmological history. The only matter available at this time to form stars is hydrogen and helium produced by the big bang. The first generation of stars to light up after the big bang are called Population III stars, and their existence can only be hypothesized because no certain observations exist of Population III stars. The oldest known star, HD 140283, sometimes called the Methuselah Star, is believed to be a Population II star, and is said to be metal poor, or of low metallicity. To an astrophysicist, any element other than hydrogen or helium is a “metal,” and the spectra of stars are examined for the “metals” present to determine their order of appearance in galactic ecology. The youngest stars, like our sun and other stars in the spiral arms of the Milky Way, are Population I stars and are rich in metals. The whole history of the universe up to the present is necessary to produce the high metallicity younger stars, and these younger stars form from dust and gas that coalesce into a protoplanetary disk surrounding the young star of similarly high metal content. We can think of the stages of Population III, Population II, and Population I stars as the evolutionary stages of galactic ecology that have produced structures of greater complexity. Repeated cycles of stellar nucleosynthesis, catastrophic supernovae, and new star formation from these remnants have produced the later, younger stars of high metallcity. It is the high relative proportion of heavier elements that makes possible the formulation of small rocky planets in the habitable zone of a stable star. 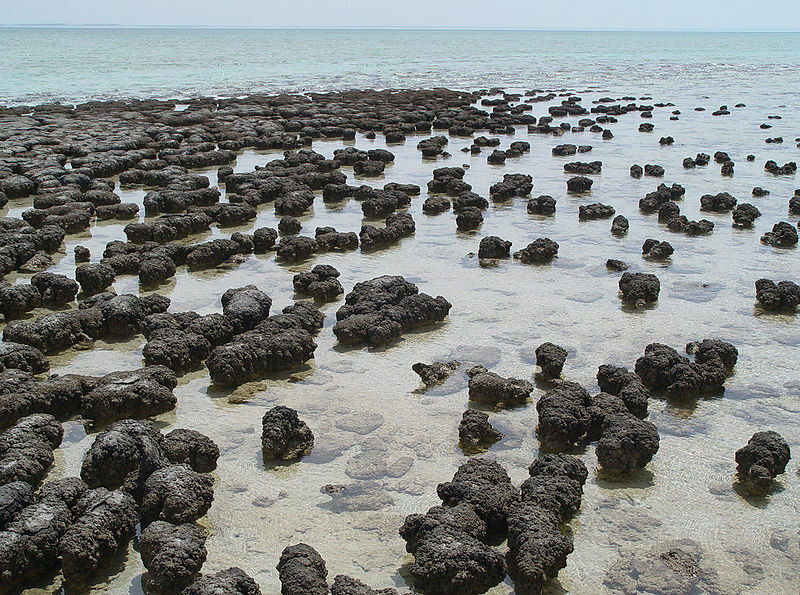 The minerals that form these rocky planets are the result of what Robert Hazen calls minerological evolution, which we may consider to be an extension of galactic ecology on a smaller scale. 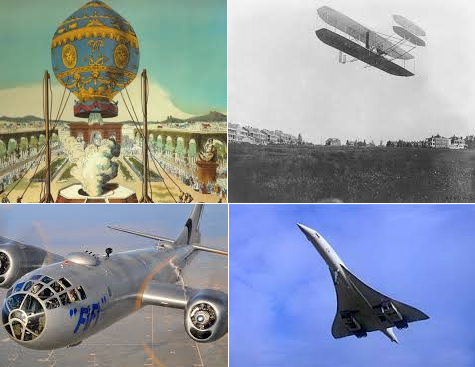 These planets, in turn, have heavier elements distributed throughout their crust, which, in the case of Earth, human civilization has dug out of the crust and put to work manufacturing the implements of industrial-technological civilization. If Population II and Population III stars had planets (this is an open area of research in planet formation and without a definite answer as yet), it is conceivable that these planets might have harbored life, but the life on such worlds would not have had access to heavier elements, so any civilization that resulted would have had a difficult time of it creating an industrial or electrical technology. In the Middle Stelliferous, the processes of galactic ecology that produced and which now sustain the Stelliferous Era have come to maturity. There is a wide range of galaxies consisting of a wide range of stars, running the gamut of the Hertzsprung–Russell diagram. It is a time of both galactic and stellar prolixity, diversity, and fecundity. But even as the processes of galactic ecology reach their maturity, they begin to reveal the dissipation and dissolution that will characterize the Late Stelliferous Era and even the Degenerate Era to follow. The Milky Way, which is a very old galaxy, carries with it the traces of the smaller galaxies that it has already absorbed in its earlier history — as, for example, the Helmi Stream — and for the residents of the Milky Way and Andromeda galaxies one of the most spectacular events of the Middle Stelliferous Era will be the merging of these two galaxies in a slow-motion collision taking place over millions of years, throwing some star systems entirely clear of the newly merged galaxies, and eventually resulting in the merging of the supermassive black holes that anchor the centers of each of these elegant spiral galaxies. The result is likely to be an elliptical galaxy not clearly resembling either predecessor (and sometimes called the Milkomeda). Eventually the Triangulum galaxy — the other large spiral galaxy in the local group — will also be absorbed into this swollen mass of stars. In terms of the cosmological time scales here under consideration, all of this happens rather quickly, as does also the isolation of each of these merged local groups which persist as lone galaxies, suspended like a island universe with no other galaxies available to observational cosmology. The vast majority of the history of the universe will take place after these events have transpired and are left in the long distant past — hopefully not forgotten, but possibly lost and unrecoverable. 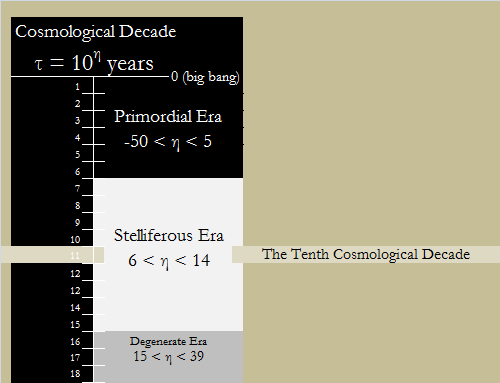 The tenth cosmological decade, comprising the years between 1010 to 1011 (10,000,000,000 to 100,000,000,000 years, or 10 Ga. to 100 Ga.) since the big bang, is especially interesting to us, like the Stelliferous Era on the whole, because this is where we find ourselves. 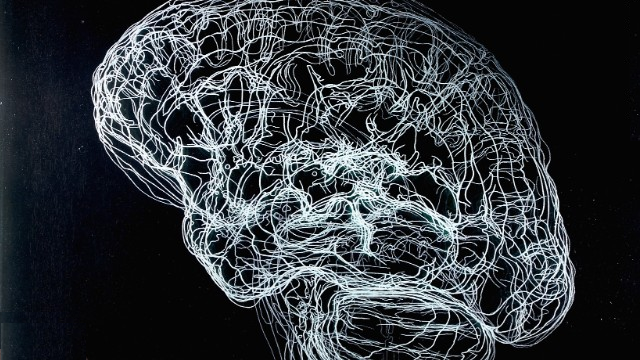 Because of this we are subject to observation selection effects, and we must be particularly on guard for cognitive biases that grow out of the observational selection effects we experience. Just as it seems, when we look out into the universe, that we are in the center of everything, and all the galaxies are racing away from us as the universe expands, so too it seems that we are situated in the center of time, with a vast eternity preceding us and a vast eternity following us. Almost everything that seems of interest to us in the cosmos occurs within the tenth decade. It is arguable (though not definitive) that no advanced intelligence or technological civilization could have evolved prior to the tenth decade. This is in part due to the need to synthesize the heavier elements — we could not have developed nuclear technology had it not been for naturally occurring uranium, and it is radioactive decay of uranium in Earth’s crust that contributes significantly to the temperature of Earth’s core and hence to Earth being a geologically active planet. By the end of the tenth decade, all galaxies will have become isolated as “island universes” (once upon a time the cosmological model for our universe today) and the “end of cosmology” (as Krauss and Sherrer put it) will be upon us because observational cosmology will no longer be able to study the large scale structures of the universe. 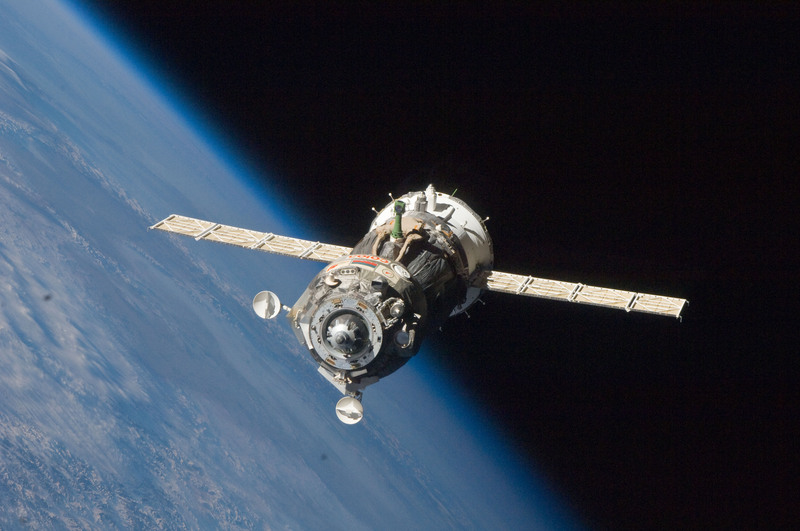 The tenth decade, thus, is not only when it becomes possible for an intelligent species to evolve, to establish an industrial-technological civilization on the basis of heavier elements built up through nucleosynthesis and supernova explosions, and to employ these resources to launch itself as a spacefaring civilization, but also this is the only period in the history of the universe when such a spacefaring civilization can gain a true foothold in the cosmos to establish an intergalactic civilization. After local galactic groups coalesce into enormous single galaxies, and all other similarly coalesced galaxies have passed beyond the cosmological horizon and can no longer be observed, an intergalactic civilization is no longer possible on principles of science and technology as we understand them today. It is sometimes said that, for astronomers, galaxies are the basic building blocks of the universe. The uniqueness of the tenth decade, then, can be expressed as being the only time in cosmological history during which a spacefaring civilization can emerge and then can go on to assimilate and unify the basic building blocks of the universe. It may well happen that, by the time of million year old supercivilizations and even billion year old supercivilizations, sciences and technologies will have been developed far beyond our understanding that is possible today, and some form of intergalactic relationship may continue after the end of observational cosmology, but, if this is the case, the continued intergalactic organization must be on principles not known to us today. In the Late Stelliferous Era, after the end of the cosmology, each isolated local galactic group, now merged into a single giant assemblage of stars, will continue its processes of star formation and evolution, ever so slowly using up all the hydrogen produced in the big bang. The Late Stelliferous Era is a universe having passed “Peak Hydrogen” and which can therefore only look forward to the running down of the processes of galactic ecology that have sustained the universe up to this time. The end of cosmology will mean a changed structure of galactic ecology. Even if civilizations can find a way around their cosmological isolation through advanced technology, the processes of nature will still be bound by familiar laws of nature, which, being highly rigid, will not have changed appreciably even over billions of years of cosmological evolution. 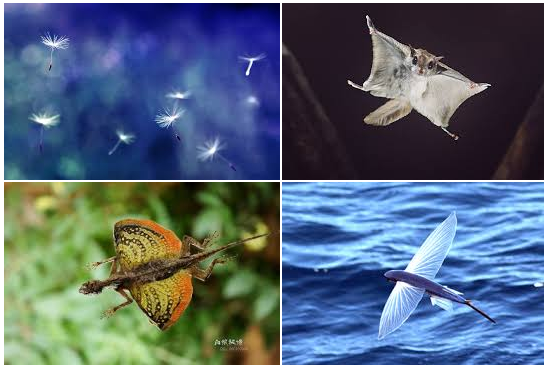 Where light cannot travel, matter cannot travel either, and so any tenuous material connection between galactic groups will cease to play any role in galactic ecology. The largest scale structures that we know of in the universe today — superclusters and filaments — will continue to expand and cool and to dissipate. 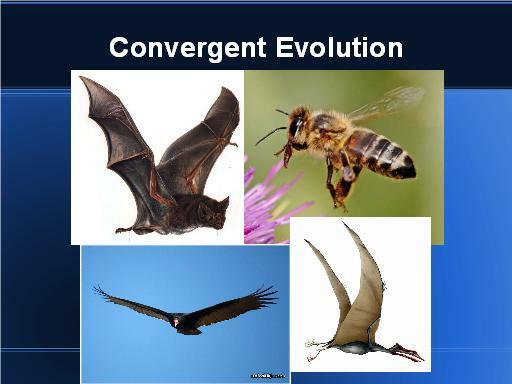 We can imagine a bird’s eye view of the future universe (if only a bird could fly over the universe entire), with its large scale structures no longer in touch with one another but still constituting the structure, rarified by expansion, stretched by gravity, and subject to the evolutionary processes of the universe. This future universe (which we may have to stop calling the universe, as it is lost its unity) stands in relation to its current structure as the isolated and strung out continents of Earth today stand in relation to earlier continental structures (such as the last supercontinent, Pangaea), preceding the present disposition of continents (though keep in mind that there have been at least five supercontinent cycles since the formation of Earth and the initiation of its tectonic processes). Near the end of the Stelliferous Era, there is no longer any free hydrogen to be gathered together by gravity into new suns. Star formation ceases. At this point, the fate of the brilliantly shining universe of stars and galaxies is sealed; the Stelliferous Era has arrived at functional extinction, i.e., the population of late Stelliferous Era stars continues to shine but is no longer viable. Galactic ecology has shut down. Once star formation ceases, it is only a matter of time before the last of the stars to form burn themselves out. Stars can be very large, very bright and short lived, or very small, scarcely a star at all, very dim, cool, and consequently very long lived. Red dwarf stars will continue to burn dimly long after all the main sequence stars like the sun have burned themselves out, but eventually even the dwarf stars, burning through their available fuel at a miserly rate, will burn out also. After the Stelliferous Era comes the Degenerate Era, with the two eras separated by what I have called the Post-Stelliferous Mass Extinction Event. What the prospects are for continued life and intelligence in the Degenerate Era is something that I have considered in Who will read the Encyclopedia Galactica? and Addendum on Degenerate Era civilization, inter alia. Our enormous and isolated galaxy will not be immediately plunged into absolute darkness. Adams and Laughlin (referred to above) estimate that our galaxy may have about a hundred small stars shining — the result of the collision of two or more brown dwarfs. Brown dwarf stars, at this point in the history of the cosmos, contain what little hydrogen remains, since brown dwarf stars were not large enough to initiate fusion during the Stelliferous Era. However, if two or more brown dwarfs collide — a rare event, but in the vast stretches of time in the future of the universe rare events will happen eventually — they may form a new small star that will light up like a dim candle in a dark room. There is a certain melancholy grandeur in attempting to imagine a hundred or so dim stars strewn through the galaxy, providing a dim glow by which to view this strange and unfamiliar world. 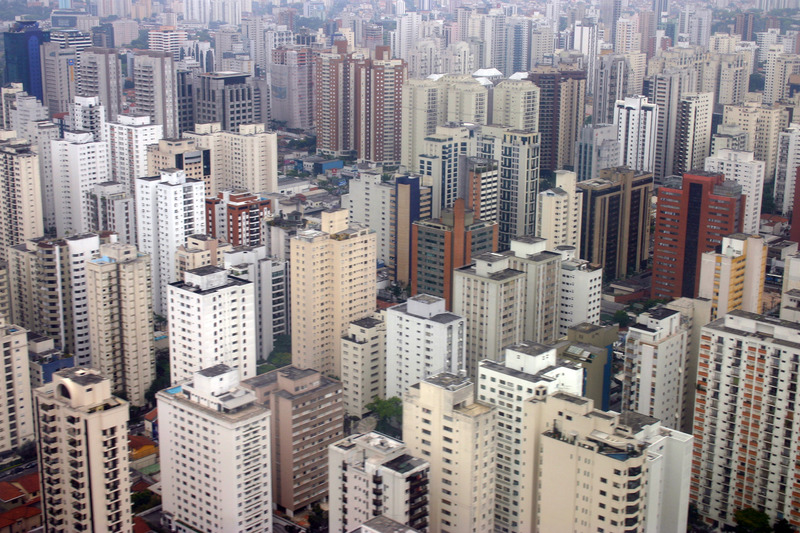 Our ability even to outline the large scale structures — spatial, temporal, biological, technological, intellectual, etc. — of the extremely distant future is severely constrained by our paucity of knowledge. However, if terrestrial industrial-technological civilization successfully makes the transition to being a viable spacefaring civilization (what I might call extraterrestrial-spacefaring civilization) our scientific knowledge of the universe is likely to experience an exponential inflection point surpassing the scientific revolution of the early modern period. An exponential improvement in scientific knowledge (supported on an industrial-technological base broader than the surface of a single planet) will help to bring the extremely distant future into better focus and will give to our existential risk mitigation efforts both the knowledge that such efforts requires and the technological capability needed to ensure the perpetual ongoing extrapolation of complexity driven by intelligent, conscious, and purposeful intervention in the world. And if not us, if not terrestrial civilization, then some other civilization will take over the mantle and the far future will belong to them.